For more than 50 years, Tennessee Wildlife Federation’s Conservation Achievement Awards have recognized the efforts of Tennesseans who make outstanding contributions to wildlife and natural resource conservation in the state. Nominations are now open across 17 categories (listed below). Everyone is invited to nominate an individual, community leader, or organization that has made a big impact on conservation in our great state. The deadline is March 1, 2019. More details, past winners and nomination instructions can be found here. CONSERVATIONIST OF THE YEAR – For the achievement(s) considered to have made the most significant contribution to the cause of natural resources conservation in Tennessee. The action should have taken place during, or culminated in, the contest year. Z. CARTTER PATTEN AWARD – For many years of effective and valuable service to the cause of conservation in Tennessee, including, but not limited to, natural resources management, environmental protection and enhancement, public education, public service, or political support. CLARK AKERS AWARD – For many years of dedicated, effective, and valuable service to the Tennessee Wildlife Federation, through its governing boards, committees, projects, or other activities. LAND CONSERVATIONIST – For outstanding achievement in land-use, watershed and wetlands development or protection, erosion control, recreational development, habitat improvement, and other management practices tending to maintain or improve the environmental aspects of land and related resources. WATER CONSERVATIONIST – For out-standing achievement in pollution control, conservation and protection of wetlands, estuaries and wild or natural rivers, prevention of water degradation quality through effective planning and management or other activity aimed at maintaining or improving water standards. AIR CONSERVATIONIST – For outstanding achievement in obtaining quality air standards, reducing pollution, affecting control of pollution sources or other action contributing to significant improvement in air standards. FOREST CONSERVATIONIST – For outstanding achievement in forest and woodlands development management or use including reforestation, preservation of wilderness areas, wildlife habitat development, fire protection, wise cutting practices and multiple-use forest lands. WILDLIFE CONSERVATIONIST – For outstanding achievement contributing to effective management, control, restoration or replenishment of wildlife resources. YOUTH CONSERVATIONIST – For the outstanding conservation effort by a person who had not attained the age of 21 during the contest year. Winner should have demonstrated ability, leadership and accomplishment in some phase of conservation. Youth groups acting together in a conservation program are also eligible. CONSERVATION EDUCATOR – For outstanding achievement in educating others on conservation. Education process may be formal or informal, aimed at persons of any age or may be leadership which, by example or demonstration, aids in the education of others. 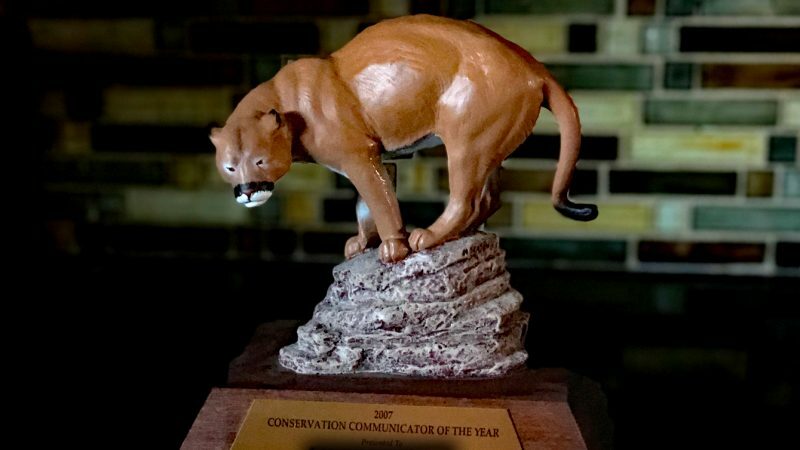 CONSERVATION COMMUNICATOR – For outstanding achievement in effectively conveying the conservation message and creating public awareness of conservation issues in the news media. CONSERVATION LEGISLATOR – For outstanding achievement by a legislator in conservation legislation or other legislative work which took place in or culminated in the contest year. Any duly elected state or federal legislator is eligible. CONSERVATION ORGANIZATION – For outstanding achievement by an organization for work in some phase of conservation during the contest year. May include civic clubs, conservation groups, garden clubs, women’s clubs, businesses and trade or professional organizations. CONSERVATION BY BUSINESS – For outstanding conservation achievement by a business or industry located in Tennessee. Achievements mandated by courts or regulatory agencies will not be considered. HUNTER EDUCATION INSTRUCTOR – For outstanding service by a certified instructor in educating sportsmen through the TWRA-sponsored Hunter Education Program and for promoting a knowledge of wildlife management as well as safe and ethical participation in all hunting and shooting activities. GED PETIT MEMORIAL AWARD – For outstanding accomplishments by a Tennessee Wildlife Resources Agency Officer in the area of citizen education, public outreach, and community services, which exemplifies the dedication, energy, enthusiasm, skills and dedication of the late TWRA officer Ged Petit. DAN & CHERIE HAMMOND SHARING THE HARVEST AWARD – For outstanding contributions to TWF’s Hunters for the Hungry program.